LiteSPOTs LED spotlights were designed to be a low profile under chassis light, a rock light. LiteSPOTs are 3 high power LEDs embedded in a clear resin housing to deliver a water and corrosion proof package that delivers a wide beam of bright light, with a 4-6 foot focal range. They are not designed as backup or driving lamps. The LiteSPOTs include a neodymium magnet encased in the resin, providing for easy "stick on” mounting to any metallic surface. There is also a thru hole drilled in each one and a supplied self tapping screw to allow for installation on non-ferrous surfaces. Each LiteSPOT measures 1 3/8″ in diameter and 5/8″ thick. 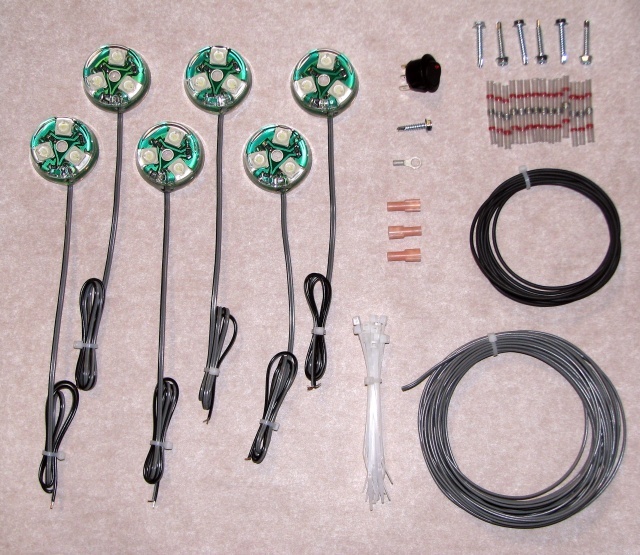 Each LiteSPOT comes with 24″ of 2 conductor 22 gauge wire attached and each unit draws approximately 120 milliamps. 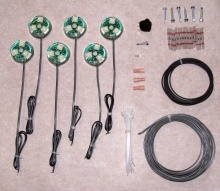 LiteSPOTs are sold individually, as pairs or as our pre-packaged "chassis kit” which includes 8 LiteSPOTs and all the wire, switch and connectors to wire these 8 under a vehicle. Also works well in pickup boxes to light up under tonneau covers and truck caps. High heat resistant, can be used under hood or inside as dome lights.